Occasionally, changing a light bulb may not be enough to restore illumination. The electric wiring could have a short, the breaker may have tripped, or the light switch may be bad. If the breaker is okay, then the light switch is the next likely suspect. Most switches stay in service for several years but may need occasional replacement. Turn off the power to the light circuit at the breaker panel. If the specific breaker is not identified, turn off the main power switch. Tape a note to the box, or lock it, to keep others from turning the breaker back on. Remove the screws holding the cover plate on the light switch with a slotted screwdriver. Loosen the mounting screws at the top and bottom of the switch with a Phillips screwdriver. Gently pull the switch out of the switch box to expose the wire terminals. Take note of the wire colors attached to each terminal, and make a list or drawing of the arrangement if necessary for reference when reinstalling the wiring. Remove the wires from the terminals. A single-pole single-throw light switch has two wires attached to terminals on one side. There may also be a ground wire on the green ground terminal. Loosen the terminal screws with a Phillips screwdriver and pull the electric wires away. Test the switch with a continuity tester. Set the switch to the off position and touch both terminals on the side that held the wires. The tester light should not come on. Then flip the switch to the on position and touch both terminals with a probe from the tester. The switch is good if the continuity tester lights. Check the switch with a multimeter. Set a digital, or analog multimeter for ohms. Calibrate an analog unit by touching the leads together and rolling the calibration dial, or wheel until the meter needle is on zero. Turn the switch to the off position. Touch one probe to each hot terminal to be sure the reading shows infinity. Turn the switch on and touch the terminals. 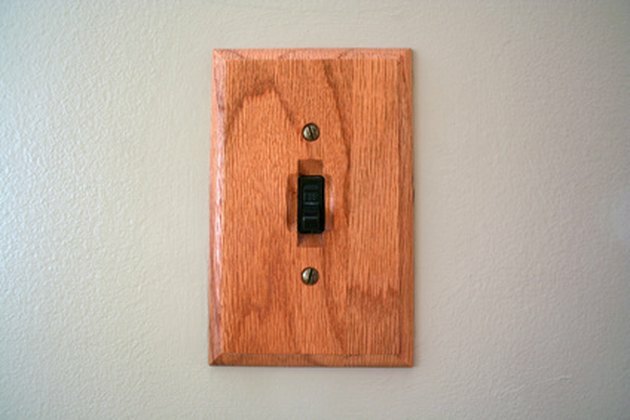 A good light switch will show a reading of zero or close to it. Replace switches that show infinity readings in the on position.